Reviews for Next Generation Stucco Inc.
Next Generation Stucco did an awesome job in repairing my ever aging and cracking, literally "holey" chimney and side all the way down to the ground. We had quite the mess with cracks and holes in various spots and a cap that was put on by another roofing company that caused some of the issues being way too tight. Next Generation Stucco showed up when promised and made short work of the repairs doing an excellent job. We have a 27 year old house and when you can match the paint as well as this team did, hats off to them. They also on the last day did a walk around the house and patched up some other areas of concern, even ones we didn't see. No stone was left unturned here including installing proper flashing and diverters to stop the waterfalls when it rained from damaging more stucco. All in all an excellent job by an excellent group of people!! Hey Rob, thanks for your review, it's very appreciated. We do our best for every customer and go out of our way to do the best job possible. Thank you for noticing our attention to detail, it means a lot to know our efforts are appreciated. At the end of the day Stucco is an elusive trade and we understand homeowners rely on our expertise, experience and trustworthiness. I'm really glad you had a good experience and thank you for taking the time to write a review. Next Generation was great. They did an excellent job matching my existing stucco with the new repairs as well as fix some additional chimney repairs. The cost was quite low compared to other quotes and they had no problems filling in additional problems as requested. Hi Johnson, thanks for the review, I didn't even request one so that's awesome of you. I'm super glad your happy with our services. We always perform the highest quality of work and try to make the experience as non-invasive on the homeowner as possible. It's tough enough to go through the process of getting quotes and deciding on a company. We're there to take care of your stucco problems with as little headaches as possible. We called Next Gen Stucco to repair stucco from poor installation by another stucco company, and to repair damage from northern flickers. They did a very professional job, better than I expected to see, and also cleaned up the debris from removal of old material and the unavoidable mess from new installation. There is no hesitation on our part to recommend Next Gen to anyone looking to have quality repairs undertaken on their property. It's rare to be surprised to the positive. Thank you very much Steve, it was a pleasure doing work for you. You trusted in our reputation and were not disappointed, that's awesome. The fact that you were not even present from the start of the job to the finish.. came home, and were beyond satisfied means a lot. It shows that we know what we're doing. Customer satisfaction and doing the best job possible is our top priority. Thank you for your trust in our company and for taking the time to write a review. I want it to be brief:- problems accurately identified, proposal clearly stated/explained and fixes professionally finished. It was a pleasure working with you and appreciated your patience. I called around for a few quotes to fix some storm damage to my stucco. Anthony responded quicker than the other guys and had a better quote. Actually charged me less than the quote because the job turned out easier and quicker. Matched the colors perfectly too so you can't even tell work was done. It was a pretty small job but he fit it in between other jobs in the area so it was done in no time. Would recommend for anyone for their stucco needs. Was a pleasure working with you, glad to be of service. Had an area of badly damaged stucco caused by an issue with the rooft. Gave very resonable quote, and did work on very short notice and in only 2 days. Work was well done and looked good. Would highly recommend. Was a pleasure working with you, your roof was in really bad shape but it's fixed now. Tony and TB did an excellent job in repairing the stucco outside my kids' bedroom wall which was a result of my insurance company's contractor refusing to continue work and leaving us high and dry. What was even more amazing was the fact they were able to locate the source of the water leak coming from the roof and stop it which the insurance contractor could not do time and again. The price we paid was fair and the work performed could potentially save us lots of money in the future. Hats off to Tony and TB! It was a challenging job but I'm happy your roof and bedroom has not been leaking since completion. The whole process was a pleasure to do with you. I spent a lot of time trying to get estimates for some stucco repairs and patching I needed done. After dealing with a lot of frustration, David was refreshing. He showed up when he said he would for the estimate and seemed to know his business. Their pricing seemed comparable to other experienced companies. They did an excellent job and cleaned up after themselves. I wasn't really sure when they were coming or going because they just seemed to mind their own business and do what they had to do. Not a problem though because they always answered my questions when I asked., whether in person or email. In the end, we did a walk through and they patched any areas they had previously missed. Overall it was a pleasant experience. Thanks Barb, I'm glad you had a pleasant experience, thats what we aim for. We mainly keep to ourselves because we are very experienced and try to have as little impact on the homeowner as possible. It was great working for you and you were an excellent customer, the job went well on both ends. I'm very happy with the stucco repairs that were done on my home. Anthony was very kind, professional, and helpful. Other people had tried to convince me that I had to do the entire back of the house but he said we could easily do a patch job, which I was happy about. Anthony even found an area that I had missed and fixed it up when he did the work. When I later found a small patch that we both had missed he came back promptly and fixed it up without even charging me extra. I was very pleased with the job and the service and would recommend to anyone. I'm glad your happy with the work Eva, it was a pleasure working with you. Anthony and his team came in and did everything they said they would at a very high quality. Matching stucco is very hard and we got a rainstorm seconds after completion which really brought out Anthony's passion for his work through his frustration. As the sun cooked it for two days it's absolutely perfect. Also his texturing skills are amazing as well. These guys are very trust worthy. 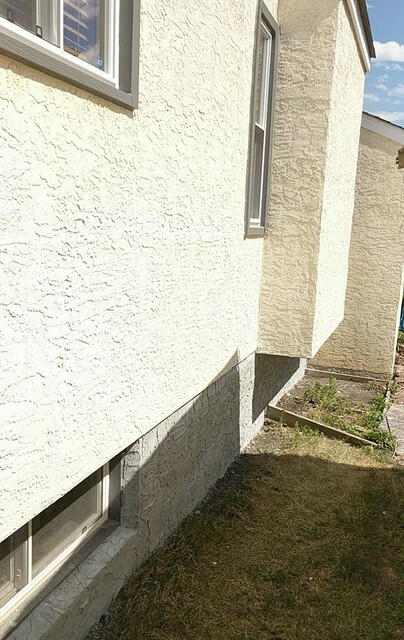 Adam, your home was definitely in need of some stucco repair and drainage fixes. I am thrilled that the color dried out and you are happy with the service. Thunderstorms come in fast and had me scrambling for cover but it all worked out well, your job was a challenge I really enjoyed working with you. More about Next Generation Stucco Inc.